It was way too hot to cook yesterday. I mean, really cook, like hunkered down in the kitchen for hours to do anything that involved pans and extreme amounts of chopping and flame-type of cooking. I’m sure you’re all aware of this by now, but I don’t like hot weather. I (currently) joke that it’s because I lived in Texas for a few years and I’ve had enough hot weather to last a lifetime, but that’s putting too much of the blame on the great state of Texas. Sorry, Texas. It’s not you, it’s me. I just don’t like summer; never have, never will. So when the mercury rises and it’s like walking into a wet dishrag full of humidity, I want easy easy easy and refreshing things to cook. This soup? Is one of those things. In the past I’ve had difficulty finding cucumber soup recipes I’ve been happy with, as they are often little more than buttermilk and/or sour cream with cucumbers and some scallions. If I wanted to eat that, I’d dip some cucumbers in ranch dressing and be done with it. But this recipe is different. It’s light and creamy, not fatty and glunky. 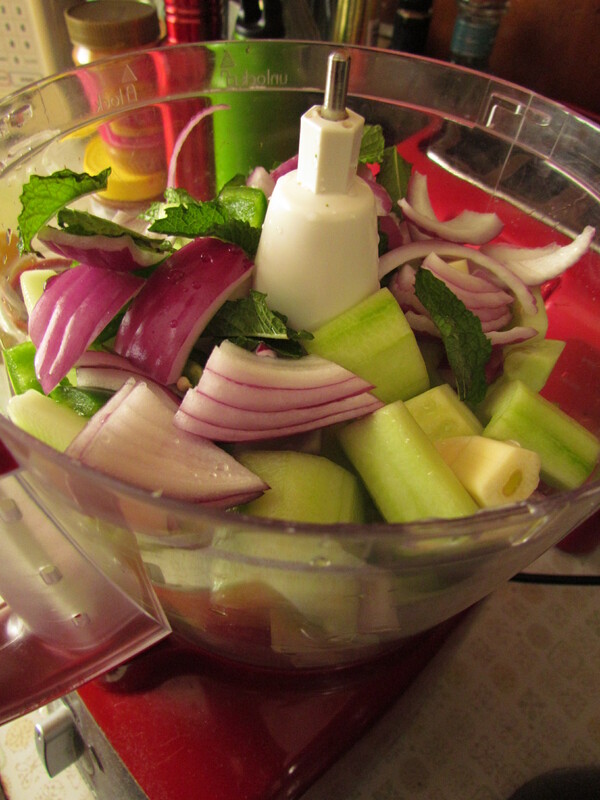 And it’s got some added spark to it thanks to mint leaves and lemon juice. Easy, highly recommended, and delicious. 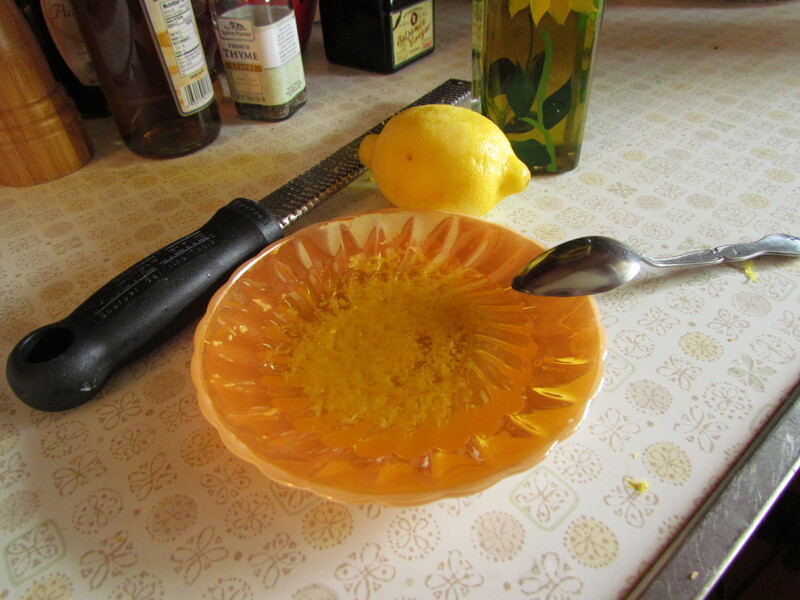 Zest your lemon before you cut it in half to juice it. Take the zest and put it in some kind of receptacle (saucer? Pyrex? small storage containter?) and add some mild oil to it. Congratulations! You’ve just made lemon oil. Cover your oil and put it off to the side. You’re done with it until you’re ready to eat. 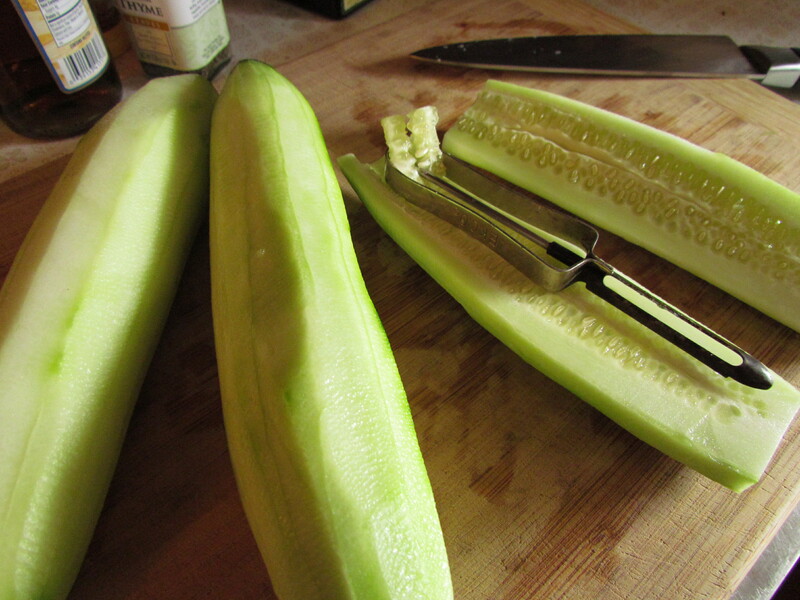 Not surprisingly, the main ingredient in cucumber soup is cucumbers. You’ll need about two pounds, and then you peel and seed them. 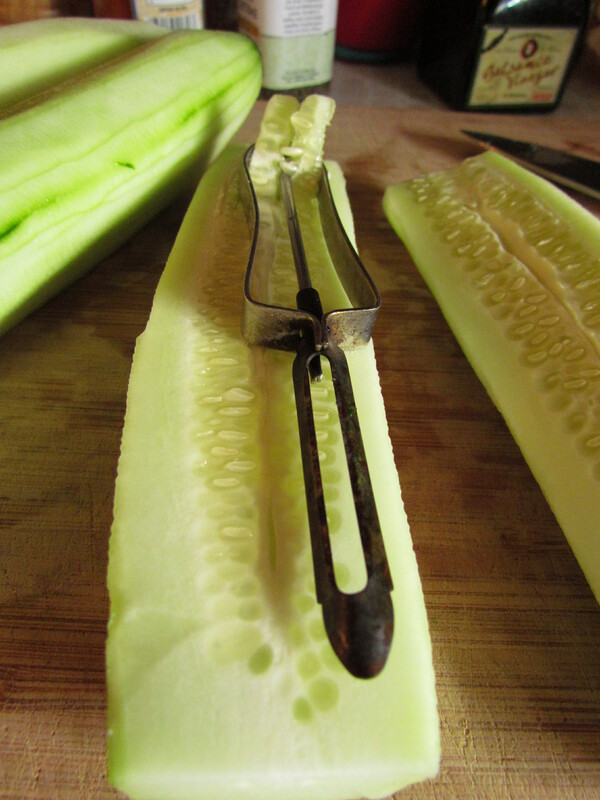 Tip: if you don’t want to pull out a second utensil to seed the cucumbers (which, as my regular readers know, would in all likelihood be the magnificently multitasking teaspoon) because of whatever reason–it’s all the way across the kitchen and who wants to walk, or it violates your austerity principles because more than one utensil is flashy, or your kitchen drawers are being guarded by wild dogs–then I have an easy solution. Take your handy, old-timey, had-it-in-the-family-for-a-thousand-years-because-grandma-gave-me-hers vegetable peeler that you think you know everything about, and flip it around to use the handle as a de-seeder. Wanna see it again? Check it out. 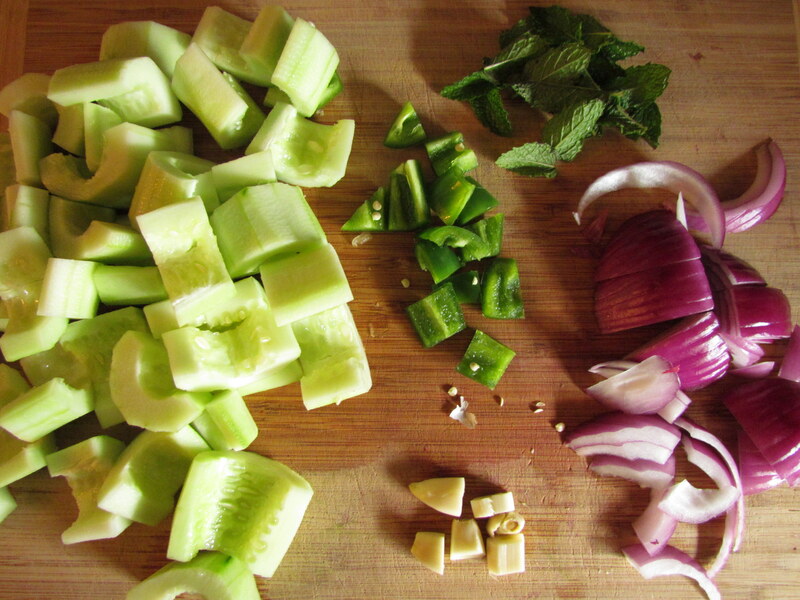 Cukes, mint, de-seeded jalapeno, garlic, red onion. Yes! Cooking like this = awesome. 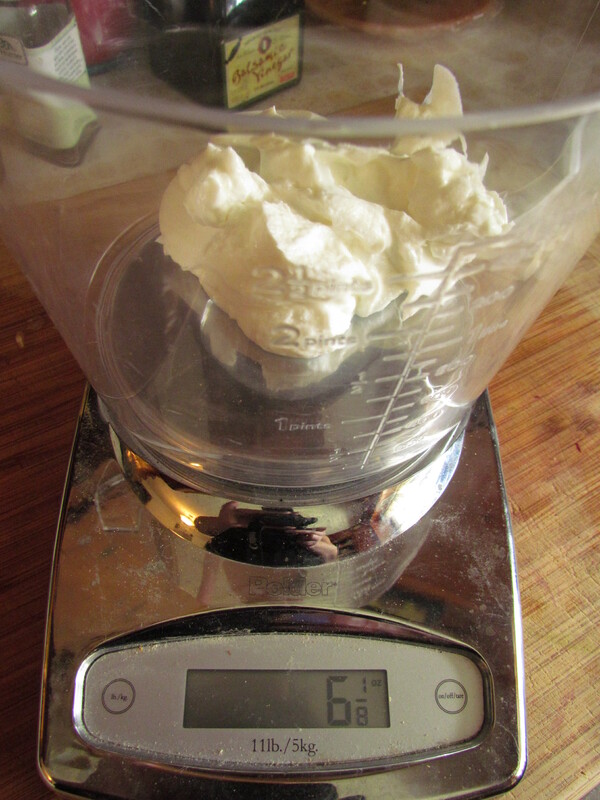 …and give them a whirl to break them down a little and create space for the yogurt, if you have a smallish processor bowl (like I have) and don’t want to fill it to the tippy-top so that it’s pushed against the lid and not mixing correctly. If you’ve got a large processor bowl, by all means, add the yogurt now. You’ll want to use a good, thick Greek-style yogurt for this. We eat a lot of yogurt and buy it by the giant bucketsful, so I had to measure mine out. So what if it’s a little bit more than six ounces? That means once the yogurt is in with the veggies, I get to lick the spatula without concern that I’m cheating the recipe. 🙂 Yes, I planned it that way. But the individual cups you get at the grocery store are usually six ounce servings, so just get one of those. See? Once again, easy. Add the yogurt if you haven’t done so already along with the rest of the spices. Salt. Maple syrup. At first I wasn’t sure if I was down with the maple syrup but then I thought, well, it’s going to add a slight bit of depth to a soup that has an incredibly bright flavor profile. So yeah, I came on board, and it was perfect. I also added fresh ground black pepper (again, because the flavor is so bright, I wanted something to add some contrast) and cayenne. Yes, cayenne. That was entirely my improvisation and you don’t have to do this at all, but I adore the combination of foods that are physically cold, but spicy. Chilled hot salsa. Ginger beer. So why not? I couldn’t think of a reason why not. And it was goooooooood. Blend it all together and put it in the fridge. Normally I don’t make a fuss about what you should store things in, but I will offer this caveat: plastics can absorb tastes and odors, especially if they’re sort of old. Glass and stainless do not. This soup only has its own innate goodness to rely on and won’t be further cooked or prodded, and is going to spend at least two hours interacting with itself. Do yourself a favor and stash the soup in the fridge in glass or stainless so it doesn’t absorb any inadvertent smells hanging around in your plastic containers. Keep it pure and beautiful. At the end of at least two hours, after you’ve lazed in your air conditioning and beaten the heat with a cocktail and a good book, take your soup out and check for seasonings. More salt? No? Yes? Bueno. 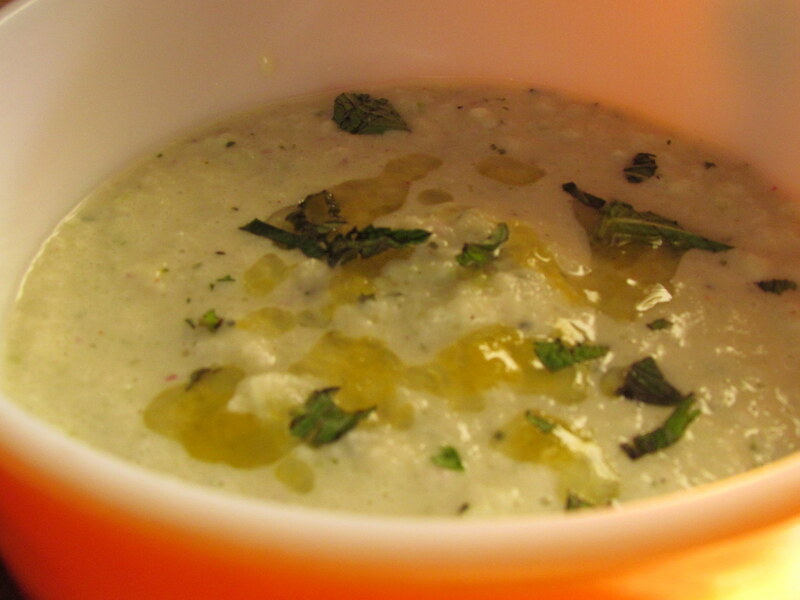 Then top it with a drizzle of your beautiful, pre-made lemon oil and a few more slivers of mint, and enjoy a cool, refreshing, simple, non-glunky, light, gorgeous summer soup. Have a salad and some grilled eggplant, if you really want to get crazy. That’s what we did. It was a total vegetarian feast, and it was gooooooooood. You’re a genius! I have some leftover Mosto’khiar (cucumber sauce) that I didn’t want to discard and now I can convert it into a chilled cucumber soup. Yeehaw! Seems like an ideal use of leftovers. Yay! I’m a tremendous advocate for leftover use, so this gives me an extra-happy. Glad to help, and enjoy that soup. We certainly did. I may make this soup. I may not. But I do thoroughly enjoy your Nosh humour and your posts in general never fail to get a laugh out of me!